HGM series ultrafine powder grinder mill is the equipment specializing in producing fine and superfine powder of non-inflammable, non-explosive and brittle materials with Mohs’s hardness under six, such as calcite, chalk, limestone, dolomite, kaolin, bentonite, talc, mica, magnesite, illite, pyrophyllite and vermiculite, sepiolite, attapulgite, rectorite, diatomite, barite, gypsum, alunite, graphite, fluorite, rock phosphate, kalium ore, pumice, etc., totally more than 100 kinds of materials. HGM series ultrafine powder grinder mill mainly consists of main unit, classifier, powder collector, dust cleaner, blower, muffler, sound-proof room, crusher, bucket elevator, storage hopper, and vibrating feeder. 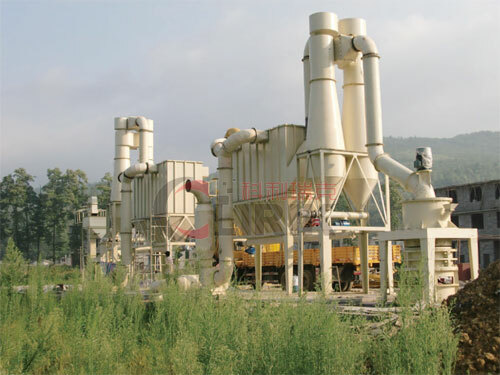 HGM 125 ultrafine powder grinder mill is the equipment specializing in producing fine and superfine powder of non-inflammable, non-explosive and brittle materials with Mohs’s hardness under six, such as calcite, chalk, limestone, dolomite, kaolin, bentonite, talc, mica, magnesite, illite, pyrophyllite and vermiculite, sepiolite, attapulgite, rectorite, diatomite, barite, gypsum, alunite, graphite, fluorite, rock phosphate, kalium ore, pumice, etc., totally more than 100 kinds of materials.